District 1 is a huge area. It begins at Willett, between Union and Central in Midtown and continues east past Germantown Parkway in Cordova. It also includes the westernmost neighborhoods of Germantown, and stretches up to Raleigh-LaGrange at Covington Pike. 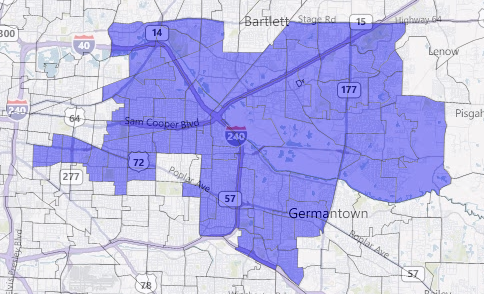 Home to over 225,000 people, District 1 is a diverse cross-section of Shelby County. Some of Memphis’ most historic neighborhoods are found in District 1, and several of the area’s most well known corporations have made a home here as well. Not sure if you live in District 1? 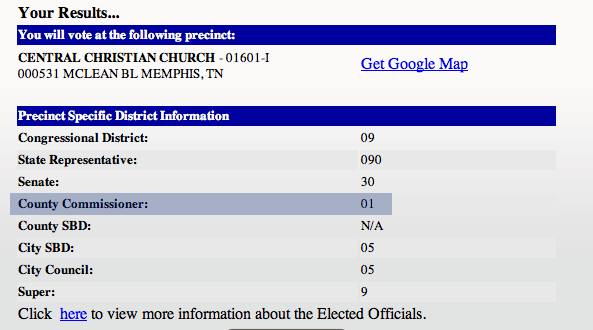 Click Here for the Election Commission’s Precinct Locator, type in your address, and hit “submit”. Next, select your address from the list and hit submit again.You should get a result like this. If you do live in District 1, please take a moment to look around. Election Day is August 2nd. Check your voter registration here, or if you know you aren’t registered download and mail in a voter registration form. The last day to register before the August election is July 2. Also, make sure you have the appropriate identification before you register. You can find out more about that here. 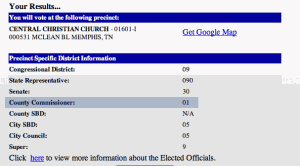 If you need assistance or have questions, feel free to drop us a line at our contact page, or you can contact the Election Commission at this link or by calling 901-222-1200.